Captain Cash lost out big in the financial crash. Click here to play! Really big. Economy of a small country washed down the drain kind of big. He's still in possession of a lot of his assets, though, and he intends to party in style before going to jail for defrauding his thousands of investors. Why don't you join Captain Cash (A.K.A. "Crazy" Bob Dellmain of Crazy Bob's Investment Portfoliorium") on his massive yacht. You could take away thousands as Captain Cash puts thoughts of extended jail time out of his mind and throws cash to his guests and to the gulls. If you like simple 3-reel classics games, then Captain Cash may offer a bit more than you expect. 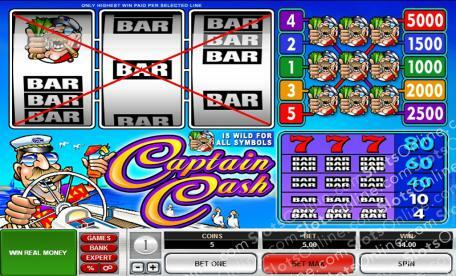 5 paylines mean that players can potentially win up to 5 different jackpot amounts for getting 3 Captain Cash symbols on a single payline. With Captain Cash having gone off the deep end after his disastrous year, it's time for lucky players to clean up from this corrupt investor's fortune on the Captain Cash slots. Captain Cash symbols are wild in this game, substituting for any other symbol. They also offer big payouts, with the maximum jackpot only available when all 5 paylines have been activated.